A ‘Facebook Container’ inside Firefox. None of us are happy with the way in which Facebook is handling our data, but many of us rely on the platform too much to follow the #deletefacebook movement. Thanks to Mozilla, you can now enjoy the best of both worlds (almost). 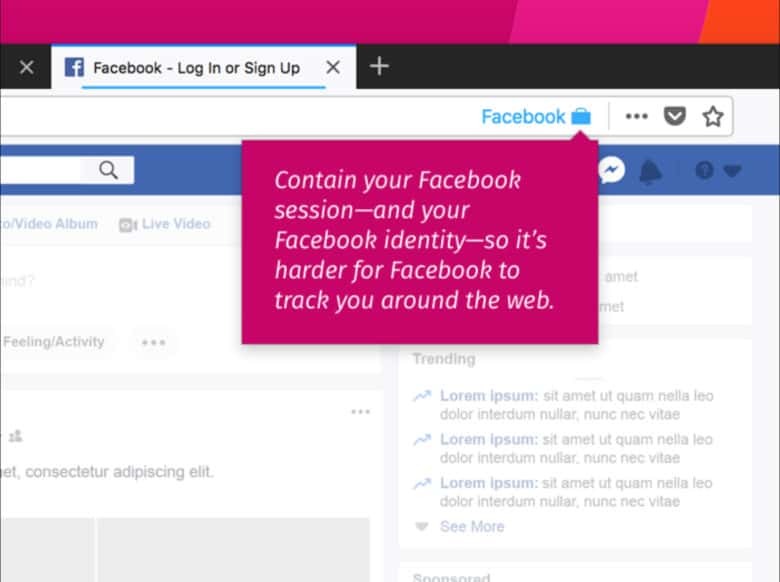 Its new Firefox extension puts Facebook inside a “container” so that you can enjoy the platform without having to worry about it tracking everything you do online. Facebook is incredibly useful if you want to know your friends and family are still alive but you don’t actually want to talk to them. Millions of people around the world can’t live without it. But that doesn’t mean you have to give Facebook all your data. There are ways in which you can minimize Facebook’s data-absorbing antics. One of them, new to the Firefox browser, prevents the network from keeping tabs on the things you do online. This makes it harder for Facebook to see which websites you visit and create targeted ads. It’s called the “Facebook Container,” and it essentially puts Facebook inside its own little box where it can’t interfere with other sites. Inside this dedicated session, Facebook works just as you’d expect, only it can’t see what you’re looking at when you’re elsewhere on the web. If you click an external link while browsing Facebook, it will open in a regular tab. If you click Facebook share buttons on external sites, they’ll load inside the Facebook Container. This extension won’t prevent Facebook from obtaining other data. And if you use the service elsewhere, it will track you there. It won’t have stopped the whole Cambridge Analytica scandal. But it’s something to protect a small shred of privacy going forward.